100th Blog … Pt II: The Footbridge. I am writing this in a bus shelter in Westcott in Surrey. Very nice. Thatched. My car is being serviced. And then it’s the school run to pick up Kyla. Got here an hour early. Westcott bus shelter and dovecote. Bus shelter and dovecote dedication plaque. When we lost Diddley, as so many people find in bereavement, you embark on a journey that is out of control at first. Lots of things to do. Arrangements. Funeral. Friends. Family. Learn to cook. Use the washing machine. No ironing. Well, only Bertie’s bow tie! Practical things that keep you very busy indeed. But then one day, when the dust has settled, for many of us you are living in a home full of memories. On your own. You know that your life will change forever. All the friends, families, self help books in the world cannot decide for you where to go next. They can help but one day hopefully you will wake up to the next day of the rest of your life. A time to be treasured, for you are still here and the world could be your oyster. I knew I liked talking to anyone in range. Felt that I had a flair for writing. I had started reading Spitalfields Life and saw the GA’s advert for a course in Spitalfields on how to write a blog. Shall I shan’t I? Well I did as has been mentioned many times in the blog. For the course, we were asked to write a short illustrated story to be evaluated. I wrote about a footbridge I loved as a schoolboy. In the event it was not read out. But a bear called Bertie started writing his own blog with my assistance. And now, amazingly, we have written between us 100. 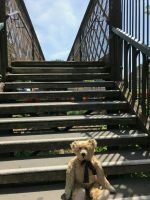 So for 100 part 2 we are going back to that footbridge and my best friend Bertie will tell you all about it. Time to pick Kyla up. The original story in all its glory. We were going to the Oval to watch cricket and had time to spare. The train went through Wimbledon, so we jumped off for some trainspotting. Not my first, of course, if you look back over 99 stories. The cricket was with David, who had also given me a book that was very useful when thinking about the footbridge. Trainspotting today at the Alt Grove bridge. Looking south towards Raynes Park. There it is – beyond the foliage. Looking north towards Wimbledon station. In amongst the vegetation, behind those grey boxes, is the “Milk Dock”. See later. Without that wire netting, I could have fallen through. The other side of the bridge, leading to a footpath. I wonder what the lights looked like? Gas, presumably. The footpath leads to the Croydon Tramlink. Once the train line between West Croydon and Wimbledon. Its claim to fame being that it follows the Surrey Iron Railway, one of the world’s oldest railways. Opened in 1802 with horse traction. Writing stories like this, it is very tempting to veer off into more and more historical detail. We are “mindful” of our readership and try to make the stories easy to read. If you are interested, Google “Surrey Iron Railway”. Really interesting. The bridge has been here a long time. A coat of paint wouldn’t be a bad idea. Even electric trains come in all sorts of different versions. This train is running alongside the remains of “Milk Dock”. See later. Diesel power for further afield – like Exeter. Seem to be sitting on a lot of steps lately. Half way down (or up). Yesteryear at the Alt Grove Footbridge. The bridge and footpath in 1898. More detail would be for a more nerdy blog. The bridge in 1928 plus the “Milk Dock”. All the black and white pictures that follow were taken from the footbridge. June 1924. “Up”train to Waterloo. 1928 looking north before Wimbledon Station was completely rebuilt. The “milk dock” is middle distance, behind the signal box in the foreground. 1957, during Bobby’s train spotting days. A Q1 freight engine pulling a large crane and just about to pass the freight vans in the “Milk Dock”. 1957 again. A modern, for its day, 4-SUB electric train. The freight vans in the background once again at the “Milk Dock”. 1957 again and by far the most interesting picture of all. This could easily fill a blog for the train enthusiasts, but maybe not for you readers with a more eclectic disposition. So, briefly … Compare the electric train with the one in the previous picture. Post war. Pre war. The signal box went years ago. There were a number of signal boxes around Wimbledon station. All eventually redundant. In the background, freight vans alongside the “Milk Dock”. But in the middle of the picture is a steam express train pulled by Merchant Navy class. “Port line”. So here is a little indulgence. Built 1948 Eastleigh works. As a streamlined engine. Streamlined. Pulling the Golden Arrow. The streamlining earned them the nick-name “Spam Cans”. Rebuilt less streamline casing. Handsome engine. In 1957. The same year as the first picture, British Railways decide to remove the streamlined casing for economic reasons and Port Line re-emerged like a dragonfly as a better looking engine. With the end of steam imminent, the last steam express trains in Britain were run on the Southern to Weymouth and beyond. Port Line clung on until 1967, when it was withdrawn from service. It had only done about 800,000 miles in just nineteen years, but was sent to the scrapyard. Thousands of engines were sent for scrap. Nobody wanted them. Many went to Woodhams at Barry in Wales. And thereby lies one of the most remarkable stories of all. Dai Woodham quickly realised that storing the engines rather than cutting them up could be a financial winner. So he stored them in a large shunting area for years, waiting for preservation groups to buy them. Eventually 213 engines were “rescued” and over 100 restored. Many or maybe most of the steam engines you see on heritage railways were saved from Barry. Port Line languished, gradually rusting away until 1982. Port Line in Barry scrapyard for fifteen years. Port Line was saved and restored. Based on the Bluebell Line for many years, where the middle picture was taken. All steam engines have major overhauls every few years . Port Line is currently undergoing major overhaul in Lancashire. Close up of Port Line’s nameplate. All this class of locomotive were named after Merchant Navy ships. A similar but lighter-weight version was known as the “Battle of Britain” Class. Was completed in 1926 for… milk! Most milk in those days being transported by rail in milk churns. Years later, when no longer needed for milk, it became a place of honour for “Mods”, as opposed to “Rockers”, when Italian scooters were imported into Britain from Italy via the former Milk Dock. A Lambretta, imported from Italy via the Milk Dock. We went on to meet David at the Oval. We picked Kyla up and lit a candle at Diddley’s Bench.